No matter what kind of business you are working within, you will have your own individual storage requirements, and it is vital that you can get these right for a number of reasons. If your storage isn’t optimal for your needs, then there is always the chance that your warehouse won’t work as well as you had hoped for your business, and for this reason you should think about the possibility of having custom shelving installed. We have put together a list of reasons that this is such a great idea, and this should help you to come to a decision that is perfect for you. Warehouses are often tight for space when it comes to the ground, and this means that if you want to make the most of the overall space, you will need to think about building your storage solution upwards instead. 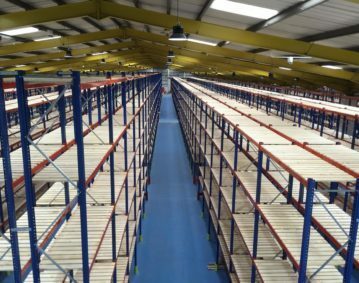 Shelving is a good idea in this respect, as you will be able to make the absolute most of any space that you have, right from the floor to your ceiling – and this is something that is certain to improve your warehouse as a whole. If you have shelves that aren’t made just for you, then you might find that they aren’t really right for the items that you wish to store. With this being true, you will struggle to keep track of everything, as the space isn’t ideal. If you have custom shelving however then this is something that can be much easier, as you will be able to get exactly the right shape and size of shelves that you need. This is very helpful, and you can truly make it fit your needs. This then means that you will have a much better idea of exactly where everything is, so there will be nothing to worry about when you need to try and find things in your warehouse. If you have custom shelves installed, then you will be able to change them and then build upon them as things grow. This means that if you’re not sure about exactly what your business needs are going to be in the future, it is a good idea to opt for custom shelving, as you will simply be able to make any necessary changes as and when required – which is good for your peace of mind. Because you are able to fit this shelving system in with the warehouse that you already have, there is no need to worry about having to find a new warehouse if your current system isn’t working well enough for you. Not only this, but it gives you the chance to actually build up your shelving system over time, rather than having to pay for the full lot in one go, and this is something that can help a great deal. When you are just trying to set up a business, it can often be quite difficult to make it a success, and it can certainly help if you can cut back on the costs that you might have to deal with. The better adapted your warehouse is to your needs, the more likely it is that it is going to be an overall success. This means that your warehouse shelving solution should be something that you seriously think about, as it can make a big difference in general, so if you are looking for a way that you can make your warehouse more fit for purpose then this could be a great choice.